Blanche Hoschedé-Monet was at the same time Monet’s step-daughter, because he married her mother, and his daughter in law, because she married his son. 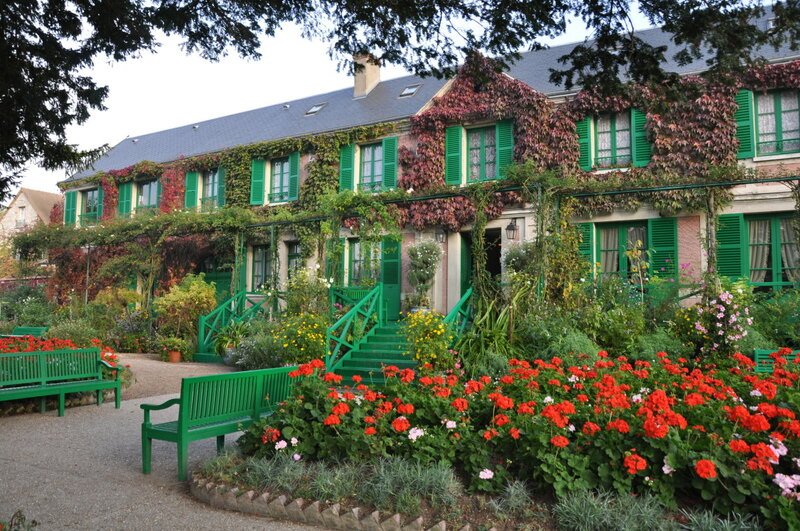 She inhabited Monet’s house at Giverny until she died in 1947, taking loving care of the estate. Her bedroom has been restored this winter and is now opened to the public. The furniture -bed, commode, bed table- had been left in the house. What was missing was carefully hunted in antique shops. The result is very charming, lively and poetic. 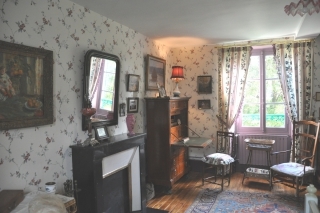 On the walls hang several authentic paintings, including a Grainstack, snow effect (circa 1890) by Blanche, who was Monet’s pupil, and a Mother and Child (circa 1906) by Manzana-Pissarro. According to Claude Monet’s step son Jean-Pierre Hoschedé, the painter loved blue flowers. This beautiful solanum, a plant belonging to the family of tomatoes and potatoes, is covered with simple little blue flowers. 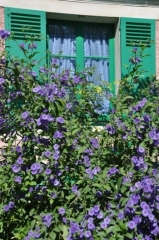 It matches the colors of the kitchen window with its blue squared curtains, a very typical french pattern called vichy fabric. In late Summer, plants are at the top of their heigth. 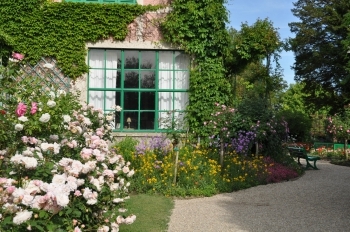 With a bit of imagination, the flowers of the Giverny garden look like big waves splashing against the walls of the house. 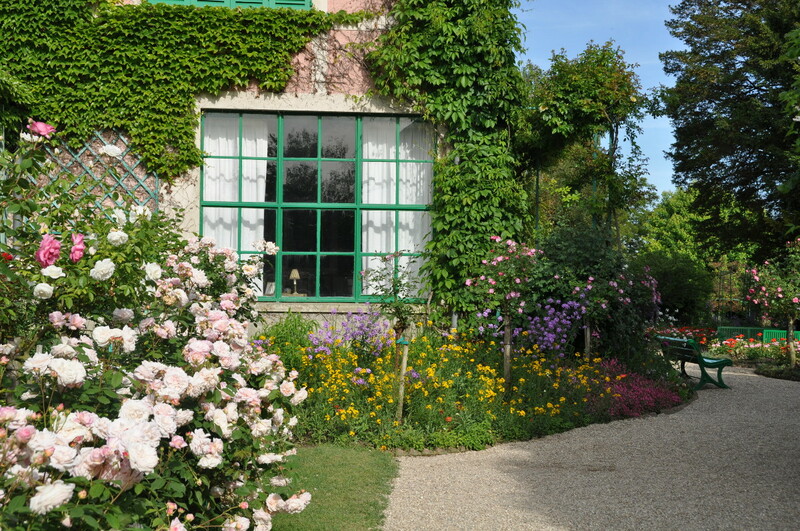 The large window of Monet’s first studio at Giverny looks like an eye scrutinizing the flowers of the garden in order to paint them. 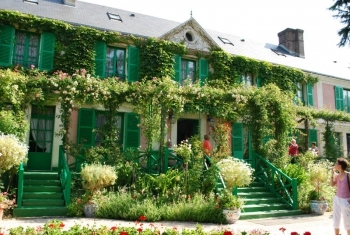 It opens onto the little rose garden, a corner that is rarely explored by the visitors of Giverny. See two posts below the view from the inside, giving the illusion of a painting. The painter Claude Monet had a special eye for refined and simple countryside elegance. 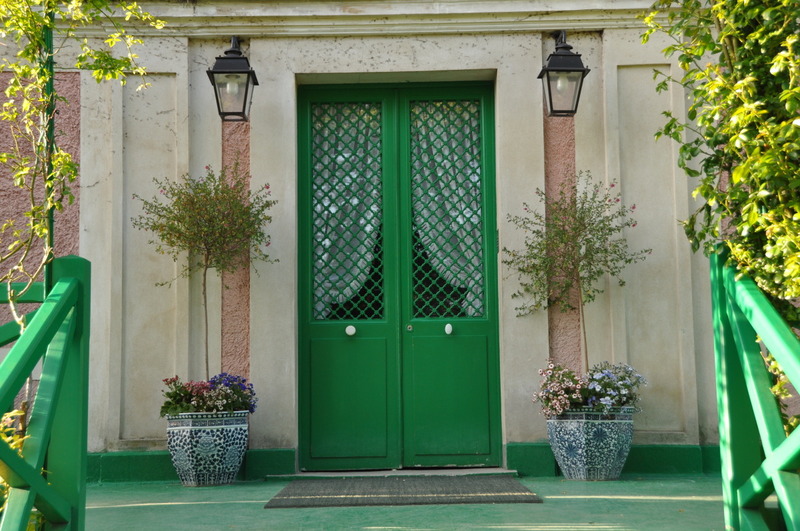 Here, the main entrance to his home at Giverny, an harmony of tender pink and bright green, enhanced by two blue Chinese pots. The balance is obtained by the symetry of the decoration. The curtains behind the iron cast door make it look like a puppet theatre. 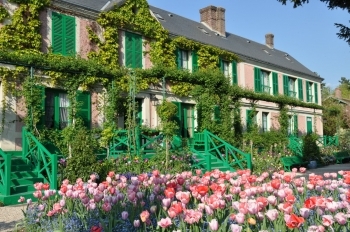 In April, the pink facade of Monet’s house in Giverny responds to huge beds of pink tulips in front of the main entrance. To create a shimmering effect, several varieties of pink tulips are planted, some redder, pinker or even orange, to resemble Monet’s brushstrokes on the canvas. The pink tulips are underplanted by blue forget-me-not. Flashing reds and greens in the soft light of October, this is what Monet’s garden offers in October in the area in front of the painter’s house. 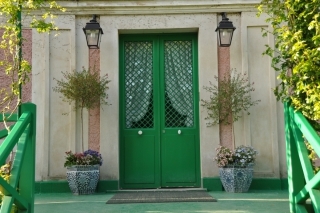 The “Monet green” spreads on benches, shutters, stairs… creating a strong contrast with the formal geranium beds and the virginia creeper on the façade. 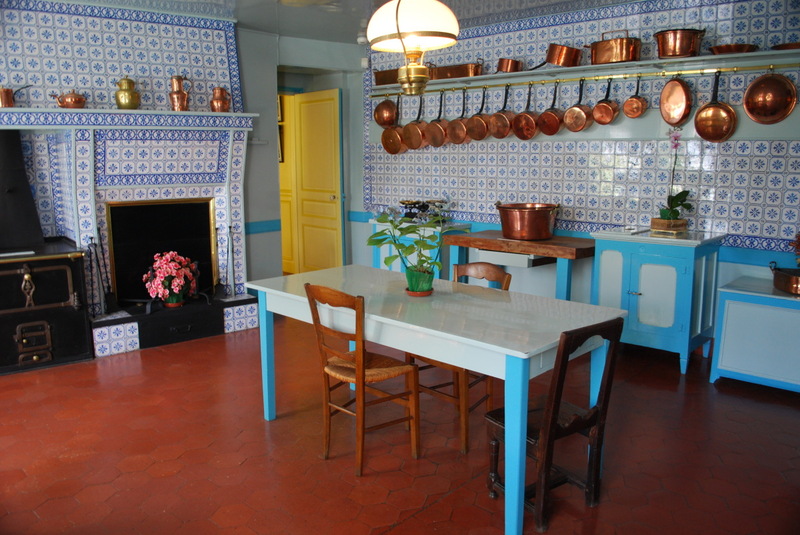 Monet’s kitchen at Giverny has a delicious flavor of old fashioned kitchens, where the scent of jam seems to be still floating in the air. Monet, as a gourmet, was very interested by all what was going on in the kitchen, but in his times it was a place for women only. He had a very good cook and collected recipes for her to test. The kitchen Monet designed for his house is very well organised. Spacey, it is covered with blue Norman tiles. It could look cold, but all this blue is enhanced by the shiny coppers. An amazing collection of saucepans, pots and kettles of every shapes, to prepare delicious meals for a large bourgeois family and distinguished guests. I had to wait until there were a few people at the entrance to Monet’s house in Giverny before I could take this picture. Generally I take great care there isn’t anybody on the snapshot. It was fun doing exactly the contrary, for a change. I wanted to please Virginia, who paints lovely pictures of Giverny. While she was in Monet’s gardens, Virginia photographied his house, but once back at home she realised she missed the scale for characters. Actually, the picture looks more lively with people on it. Why must we always wait and take empty pictures? To give the illusion we were alone on the site? Or just to avoid photographying people we have not been introduced to? 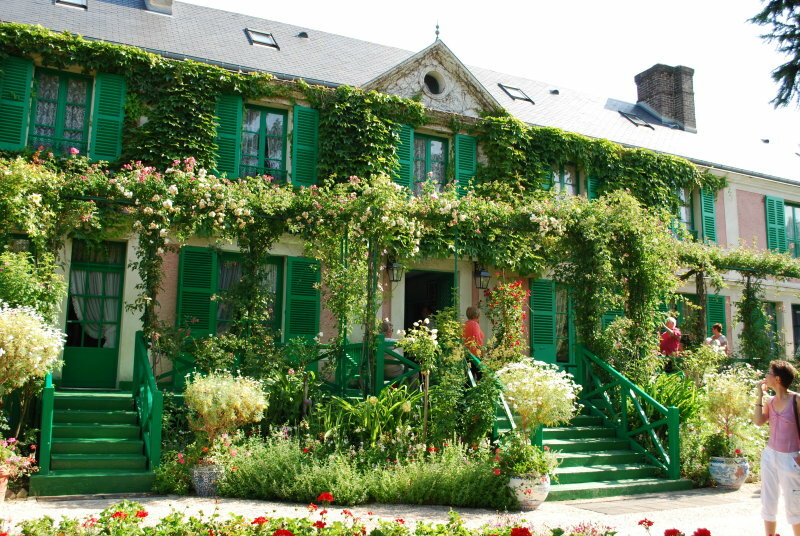 Monet’s house is not that easy to paint, because of the perspective. To see it you must stand on its side, for two yews hide the house when you face it. 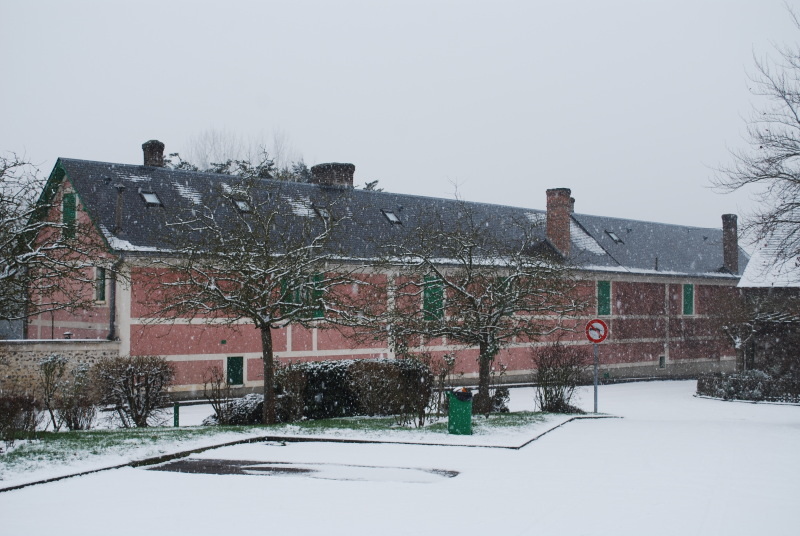 It was Monet’s idea to mask the building, as it is extremely long: about 40 meters, 130 feet! Strangely enough the house is very narrow, only 5 meters. Monet’s house at Giverny looks exceptionally long while it is shallow. The reason for this disproportion? 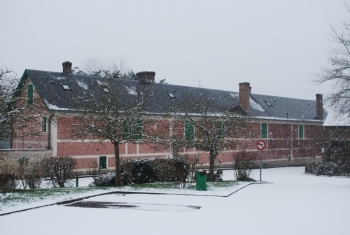 Monet bought a medium sized farm, but he needed more space because of his extended family. Therefore he added two wings to the original building. On the right he converted a former barn into his first studio. Over the studio he had his own bedroom and bathroom. Monet had even his own stairs and a garden door at his disposal in order not to disturb the family life when he went out early to paint, or when he came in with art collectors. 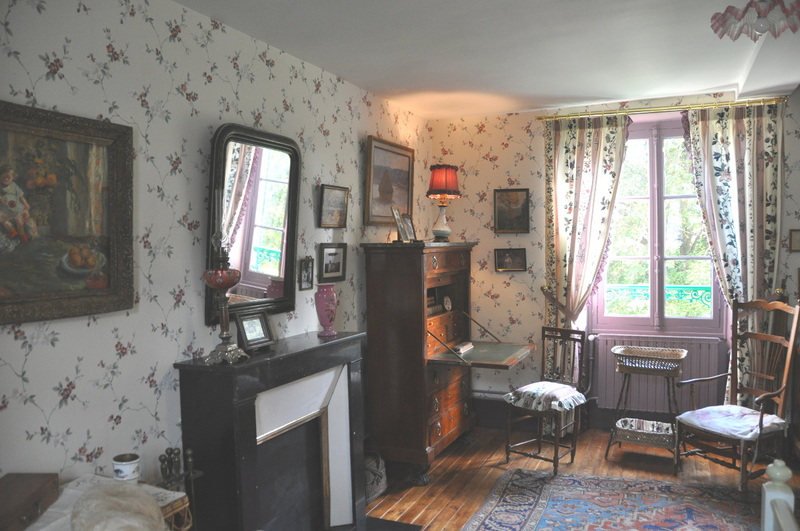 On the other side of the house, Monet demolished the tiny farm kitchen and designed a big and modern one, more suitable for a bourgeois family with gourmet tastes. Over this new kitchen there were rooms for Alice’s four daughters. The four boys had their rooms in the attic.